SYDNEY, Australia -- Australia pledged its support for Ukraine during a visit by the nation's president on Thursday, with Australia's prime minister calling for an end to the bloody conflict in Eastern Europe and Ukraine's leader urging Russia to withdraw. 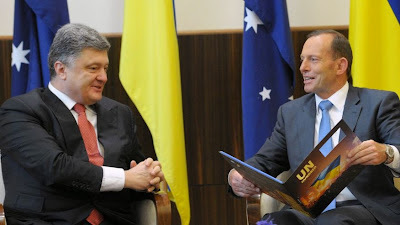 Dec. 11, 2014: Australian Prime Minister Tony Abbott, right, holds a book given to him by Ukrainian President Petro Poroshenko as they meet at the federal government office. Australian Prime Minister Tony Abbott, a sharp critic of Russia since Malaysia Airlines Flight 17 was shot down in July over rebel-held territory in eastern Ukraine, said Russia must honor a little-respected cease-fire agreement signed in September. "The side we take is the side of freedom, democracy and self-determination.... And plainly, freedom, democracy and self-determination are currently at risk in parts of Eastern Europe." Ukrainian President Petro Poroshenko, in Australia for a three-day visit, urged Russia to withdraw from the region, where both sides have been engaged in a one-day truce that Poroshenko proposed in a bid to revive the September cease-fire deal. "Please stop the fire. Please release the hostages. Please withdraw your troops from my territory. Please close the border," Poroshenko said during a press conference in Melbourne. "And I promise if you close the border, within one, two, three weeks, we have peace and stability in Ukraine. Very simple." Australia and Ukraine have formed close ties over the Flight 17 disaster, which killed everyone on board, including 38 Australian citizens and residents. Abbott and other Western leaders have accused Russia of providing military support for those who shot down the plane. Russian state-run TV has blamed Ukraine's air force. "If it turns out that people under Russian authority had a hand in this, we absolutely expect them to be surrendered to investigators and to prosecutors because this is an atrocity," Abbott said. "It was mass murder on a vast scale." The two also discussed a potential energy export deal, with the Ukrainian president saying his country may buy Australian uranium for its nuclear power stations, along with coal. "Australia is an energy superpower and energy security is very important to Ukraine, particularly given its current vulnerability to supply shocks," Abbott said.